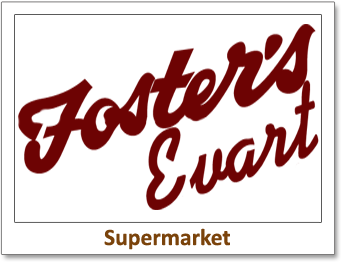 When you shop at Foster's Evart you can be sure you're shopping the freshest, best quality products around. We offer quality Tender Ridge Angus beef, grain-fed, hand-selected and aged to perfection for the most remarkable flavor and genuine tenderness, freshly cut every day. In our deli you'll find the exceptional quality and old-World flavor of Lipari products in freshly sliced meats and cheeses, convenient sides, our specialty signature items, and so much more. Our farm-fresh produce selection is ready for picking every day, and you'll find everything you're looking for in our center store, from day-to-day necessities to specialty items. We're ready every day to serve you and make your shopping experience at Foster's the best you've ever had, because that's just how it should be: small town friendly, small town proud.